Costa Rica has long been on my "bucket list" of places to visit, and the more I read and learn about this country, the deeper my yearning to go develops. Not only am I very interested in the wildlife (and taking photos thereof), but I also hear that the locals are friendly and the scenery spectacular. 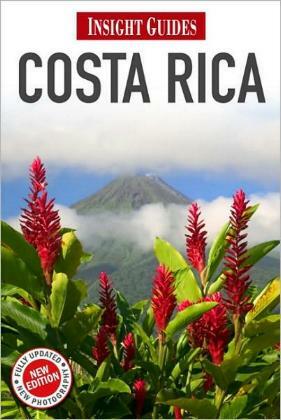 This beautiful book from Insight Guides help whet my appetite for Costa Rica even more. Absolutely stunning (and very enticing) photographs lavishly illustrate the diversity of what you can expect to encounter from your visit. Lush forests with exquisite birds (what really appeals to me) and butterflies compete with a live volcano, many national parks, beautiful coastlines, and their coffee, of course. This book offers a concise look at the Best of Costa Rica—Editor's Choice: (Best Wildlife Viewing, Best Beaches, Best Hikes, Most Scenic Drives) and Cultural Bests. The book offers historical information (Costa Rica is not without problems), geographical info, commercial info, the people (a delightful mix), and the food. It was sad to read about the high crime and drug problems. However, like most countries, there are great things to be enjoyed over and above the bad, just beware of the bad elements. There are a huge number of national parks full of wonderful wildlife which draw millions of tourists annually. Not only do people come to see animals, there is also a wealth of flora to enjoy as well. There are two oceans (Pacific Ocean and the Caribbean Sea) and coastlines to be enjoyed, and much in the way of sporting activities. There are also extreme sports to investigate. Everything you'll need to know is covered in this gorgeous book: transportation, accommodations, etc. Something I long to see and photograph, which I believe is very probable, are the quetzel birds. Maps abound in this book, so planning is made easy. I loved the travel tips at the back of the book which were very helpful. For me, travel is as much about seeing as reading, and I LOVED the photos in the book. Conclusion - One of the nicest travel guides I've ever come across.